This resource has teaching tools and lesson plans that utilize the zine collection for language arts, media studies, information literacy and historical purposes. The original site, with higher functionality is still accessible from the Barnard network. The Institute for Research on Women and Gender at Columbia University launched its 25th Anniversary celebration with Girls Rock!, a daylong multimedia exploration and demonstration of music as an empowering force for girls and women. 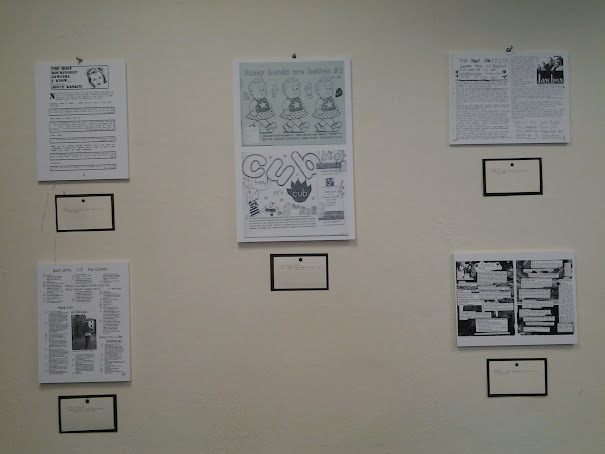 As part of that celebration, selections from Barnard’s Zine library depicted the strong bonds between music and zines in the exhibit Girls Write. This exhibit is an online version of the physical installation. Girls Write, Elvis Bakaitis and Jenna Freedman, curators. Fall 2012. See description in the online exhibits section above. Marissa Falco Retrospective, Elvis Bakaitis, curator. Winter 2013.